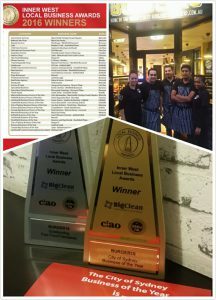 Burger10 one of Sydney’s favourite burger joint received two awards for Excellence at the Inner West Local Business Awards 2016, held on 29 June 2016 at Burwood RSL Club. It was a remarkable night for Burger10, the upbeat gourmet burger restaurant was awarded 2016 Winner for ‘Outstanding Fast food/ Takeaway’ category and was also given the highly sought after title ‘City of Sydney Business of the Year Award 2016’. The win capped off a sensational second year for Burger10 since its opening in 2014. The Local Business Awards acknowledge outstanding local businesses and their people who go above and beyond. It also aims to develop and strengthen the bonds between businesses and the community thereby improving the standards of local businesses. It showcases many individuals and businesses from startups (Under 3 years) to established larger businesses. The popular awards program is being presented by Precedent Productions, which established the awards 30 years ago. 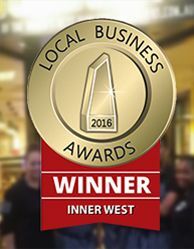 “This award is an indication of our growing presence in the market, which can be attributed to our team’s hard work, professional approach and quality of food and service. Our approach is truly customer centric keeping customer service as No 1 priority” said Hussein Jaber, Director/ Executive Chef of Burger10. We are a gourmet burger restaurant in Sydney that prides itself on providing customers with a unique burger tasting experience. There aren't any other restaurants in Sydney where you can try the flavours of the best 10 burgers in the world. At Burger 10 we offer unique signature burgers, handpicking famous ingredients of a country and creating that unforgettable burger tasting experience. For more information contact us on email: info@burger10.com.au or call (02) 8283 3878. Connect with Burger10 on Facebook, Twitter, Instagram or Google+.